Take a look at what your support does for our schools! What a wonderful 2018 - 2019 school season start! - a surplus of applications full of enrichment ideas and already, 10,000 allotted for support to our students and faculty! These ten grants represent about 17 different staff members - some are part of more than one award! These grants total almost 5000 dollars and will affect students in a variety of areas. The Foundation was impressed by the depth and breadth of areas covered by the grants and know that these grants will make a difference in students' lives. Susan Armstrong received a grant to purchase a refrigerator for the Transitions Classroom. If you have not stopped by to see what amazing things they have done in there, you should! Susan Johnson and Stephanie Ask received a grant to purchase some high end sound recording equipment for the Media program and other uses around the school. We are excited about the energy these new-to-the-district teachers have brought with them. Catherine Berg received a grant to support Science Olympiad. It goes to both equipment, fees, and scholarships for students to participate. We really appreciate Catherine's efforts to make this program available to everyone. Kathy Bayne and Josi Richter received a grant to fund their first grade classes in using the Iditarod race as a focal point for learning math, geography, science and more!. They have been using this curriculum for several years and it is a wonder to watch their classes weave in learning in so many areas. Colleen Fox received a grant to help her make use of our local science resources. How many of you even knew Camp Casey had a Marine Lab? Well, Colleen does and now her students will also. She has also gotten Penn Cove Shellfish in to the act to help her students see the real world applications of their learning. Greg McMichael and Jennifer Bassett will use their grant to provide an adaptive chair to a student that they recognized could benefit from something a little different. Thank you Greg and Jennifer for looking out so well for Coupeville students. Wilbur Purdue, Susan Armstrong, Chad Felgar, Catherine Berg and Megan Austin received a grant to use garden beds as a focal point of learning in so many areas I can't list them all. Just look at the many different areas they represent. The Foundation was very excited to see so many teachers using a multi-disciplinary, hands-on approach to learning. Deb Sherman received a grant to provide Legos for her students to use at recess and other times to enhance their hands on creativity. We appreciate her giving of her time and taking the effort to provide something extra and special for these students. Peg Tennant and Stephanie Ask received a grant to take students active in drama to a production of "Romeo and Juliet." We appreciate their efforts to introduce Coupeville students to activities they don't get to see unless they make these trips. Mark Noste, Diane Skaley, and Trish Didier received a grant to take the second grade to a production of "Junie B's Essential Survival Guide to School." The Junie B book series is actually something students explore in class and this trip should be a great tie-in and culminating event. Please congratulate these recipients for taking the time to do something extra for students. If you have an idea that needs support, our next deadline for grant applications is May 2, 2017. Grants awarded then do not have to be spent until June of 2018, so they are designed to get you a head start on the 17-18 year. I have attached an application form. As a final note, we had enough money to fund all the applications we received. This is not always the case, but we do want you to know that if you have a need, there is a good chance we can help you with it. President, Community Foundation for Coupeville Public Schools. 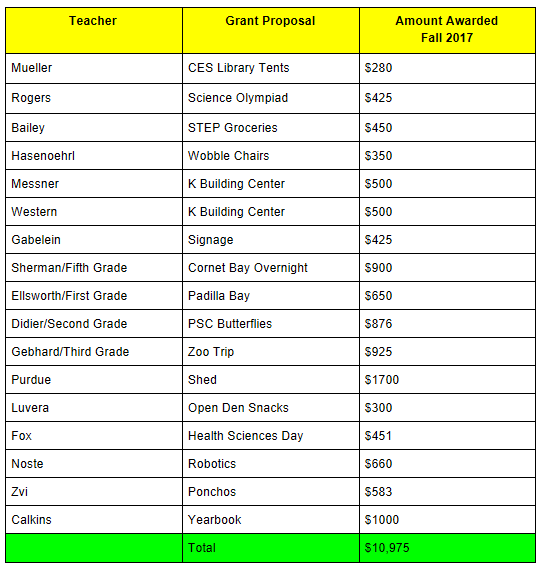 In October of 2016 - the following grants were awarded to our teachers. ​Your donations make all of this possible!